What H.O. Bostrom Seats are Available? H.O. Bostrom Seats smooth out the ride! Fishermen, recreational boaters, commercial operators and passengers just along for the ride, may have a variety of expectations, purposes and uses for boat seats. Marine seats must be able to withstand the salt water, harsh weather, rough waves and the sun’s UV rays. In addition, the mounting system of these seats must endure through a number of stresses that it is exposed to while in motion. Boaters shopping for a seat at the helm may consider H.O. Bostrom’s SeaPost Marine Pilot Helm Seat, which offers ergonomic support for comfort and complete adjustability. As opposed to traditional console seats, which offer three inches of height adjustment, the marine helm seat offers six inches of travel. In addition, a standard fold-up footrest is available with three height positions. The SeaPost Pacifica Seat with Torsion 380 mechanical suspension differentiates itself with a shock-absorbing pedestal system that can preserve a captain’s comfort over rough seas and can support operators weighing up to 275 pounds. Like many of H.O. Bostrom’s marinized seats, this model is composed of internal padding covered in a urethane skin that will not absorb water. 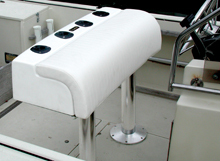 Finally, the SeaPost Boat seat is durable and long-lasting; it comes with a 5 year manufacture warranty. At the Sydney International Boat Show on July 29, the Australian pleasure boat-maker, Riviera, will reveal its latest model, the 43 Open Flybridge. Riviera’s CEO, John Anderson, anticipates a successful release, as the company’s most recent models have all been well received on the pleasure boating market, BYM News reports. “The sales performance of our new models, including the 5800 Yacht, 5000 Sport Yacht, 51 with IPS and now the 43 with IPS have all generated a significant volume of sales,” Anderson told the news source. The vessel includes sleeping accommodations for up to six people in two large cabins. The Volvo Penta Inboard Performance System (IPS) is designed for greater fuel economy and lower exhaust levels. Managing boat exhaust is a consideration of many boaters, from yachters to captains of smaller powerboats. The manifold collects exhaust gasses from the engine’s cylinder, cools the gasses with water, and pushes them through an exhaust hose, outside the stern. Generic exhaust manifolds bought for a V8 or V6 engine are sold in sets, including both right- and left-handed models. Boats with ‘straight’ engines of 3, 4 or 6 cylinders usually contain a single manifold and riser located near the top and along the cylinder bank. These smaller boats can use generic or aftermarket exhaust manifolds to replace a vessel’s original equipment. H.O. Bostrom is widely considered to offer the highest quality of boat seats regardless of the size of one’s seacraft or boating needs. Their seats often come with an array of features, including adjustable risers, foot rests and heights of suspension. H.O Bostroms seats are used in all forms of commercial service, from; tugboats, fire trucks, offroad loaders to buses. This popular manufacturer’s latest line of marine seats is the SeaPost Pacifica Seat with Torsion 380 mechanical suspension. The shock-absorbing pedestal system that comes standard on this model allows for a high level of comfort and support on rough waters. A built-in damper provides for four inches of shock absorption during travel. In addition, a high-strength torsion bar suspension system can be adjusted to suit passengers weighing between 110 and 275 pounds. These seats are tested to withstand the harsh elements and environment that boaters sometimes encounter. The internal foam that comprises the seat is covered by a urethane skin that is resistant to water. In addition, H.O. Bostrom’s multi-coat marine finishing system on all metal gives the seats a high-caliber corrosion resistance. The patented H.O. Bostrom adjustable riser can be used to adjust the height of the seat between three and six inches. Oil coolers with a fresh water cooling system use the water from a lake, river or ocean to lower the temperature of the engine’s coolant. A type of heat exchanger, this product keeps the engine or transmission oil cool while the vessel is in motion. Heat exchangers and oil coolers manufactured by Seakamp Engineering are a popular choice for boaters, and can be used for most fluid to fluid cooling applications. Seakamp’s Mercruiser direct replacement heat exchanger allows for freshwater engine cooling as well as the use of a hot water cabin heater when navigating in cooler climates. In addition, Mercruiser heat exchangers and oil coolers prevent electrolysis by using dual zinc anodes, as well as corrosion resistant metals in their construction. With electrolytic reaction, the zinc will actually corrode and wear away, while preserving the copper and copper / nickel alloy metals that make up in the heat exchanger, oil cooler and engine system. Heat exchangers and oil coolers are easy to install and can dramatically extend the life of a boat’s engine by protecting the entire motor system from rust and corrosion. Seakamp Engineering products can be customized to the exact requirements, size and fittings of most vessels. The primary reason to order a replacement boat canopy from CoverTuff is to fit your original manufactures frame and to protect your vessel from the wear and tear it faces from wind, rain and the sun’s ultraviolet rays. With these purposes in mind, CoverTuff constructs its boat canopy covers to fit right, the first time, and helps your boat withstand the forces of nature and protect your watercraft for years. To protect your boat from the sun, CoverTuff boat canopies feature rot-proof threads that are resistant to UV rays, and rotting. Your vessel will also be kept safe from the rain by virtue of seams that are stitched from the underside of the canopy, to reduce the canopies likelihood of leaking. Each CoverTuff canopy frame is designed for a custom fit; corner seams line up with side seams for a cleaner appearance, improving the view from any angle. These canopies feature fine details such as quality materials, scallop side and end trim and zigzag stitching. CoverTuff canopies are ideal for new canopy frames or as a replacement to an existing frame. When replacing a canopy on a boat lift prior to 2005, you will be setting the springs aside and instead, you will be using the replacement shock cord system for secure attachment. Everything that you need to install the CoverTuff replacement boat canopy is included with your order. The Todd Marine Leaning Posts from Go2marine are an upgrade and replacement for your aging Boston Whaler, or other center console type boat seats. A backrest for the leaning post is available, essentially turning the leaning post into a bench set. This simple clean setup allows you to remove your original pedestal seats and mount the leaning post. You retain your original, existing pedestals. The posts of the new leaning post adjust from port to starboard, from 21″ on center to 28.5″ on center, matching up to your existing post mounts. The video illistrates just how simple this change is. Go2marine offers the Leaning Post in a Fixed Pedestal and Adjustable Pedestal version. Go2marine’s full line of Marine Boat Seats.